Forty years ago this month, a group of my friends and I released "Free to Be... You and Me," a children's record created to expel the gender and racial stereotypes of the era, while rewriting all those pat "happily ever afters" that dominated the fairy tales of our youth. Our mission was simple: to convince children that their dreams were not only boundless, but achievable. What happened next stunned all of us: the record immediately went platinum. This inspired us to follow up with a companion book and a TV special, both of which enjoyed the popularity of the original LP. "Free to Be... You and Me" was suddenly no longer just a title. It became a coined phrase -- a cultural touchstone -- that spoke of the times in which we lived. It was also a commercial success, which allowed Gloria Steinem, Pat Carbine, Letty Cottin Pogrebin and me to use proceeds from the project to co-found the Ms Foundation, to help women and children in need. This month's 40th anniversary caused quite a buzz, and all of us who were involved in its creation were touched by the fuss that was made over our big birthday. Newspapers interviewed us about it; seminars were held to discuss it; even a new book was written about it: When We Were Free To Be: Looking Back at a Children's Classic and the Difference it Made. It's gratifying to be honored for the past, but in speaking with some of my collaborators, we decided not to look back, but to look forward. And just like we ask children who are still picking up the book these 40 years later to open their minds to all the possibilities, we ask ourselves what we would tell children today that would make them even more "Free to Be?" who they can love. And I'd end my song with the words: "You = Me." because Kurt crystallized the vision that all of us had for the project. to generation. That was our secret dream. Happy 40th, "Free to Be!" computers and talk to children on other sides of the world. They can Skype someone millions of miles away and learn how other people live and play and go to school and learn. above their head and the earth below their feet. If I were starting a song, I might call it "We're All In This Together." I also like the idea of encouraging political activism. (Marlo had a fun title for a song about that -- "It's All Right To Speak Up!") Children often feel that no one is listening to them, but if lots of kids bring their voices together, there is strength and power in that. If people who feel the same way about something combine their voices, those voices will beheard. singing it and ended with a hundred thousand kids singing it? The more I write -- and the more I think about this --- the more I'm convinced that there's still a world of things for us to say to our free children. protection of the generations that were yet to be. We fell prey to greed and in our lust for power, destroyed much of the world that we inherited. Each and every one of you is that "someday." Alan Alda (directed the performances on the album; narrated and sang on the album and the TV special): "I still wish for us all, young and old, the chance to be Free to Be who we are deep down -- but now that I've lived an extra 40 years, I wish for even more: to be free to become what we can, to reach above ourselves. To think of the happiest, kindest, lovingest, laughingest, creative person we can possibly be -- and then be it." Carole Hart (co-producer): I think "Free to Be" itself is pointing us to its next iteration. bringing things together for the greater good. illustration gifted to us by the great artist Peter Sis. It's called "If Wishes Were Fishes." and working together, we both will be free. The wish that I got from the mouth of a fish." I'd love to animate that piece and set it to music. And then I found myself re-reading Kurt Vonnegut's Afterword in the book, to which Marlo serendipitously refers. He concludes that if he were to write a manual for kids he would teach them about cultural diversity and relativity; that there are thousands of cultures and they all work pretty well. And that is a source of hope. We can learn from each other. interactive pieces as well -- celebrating multiculturalism and its teachings. May it be so. May it be so. May it be so. Gloria Steinem (wrote prologue for the book; co-founder of the Ms Foundation, which benefited from the project's proceeds): "Free to Be...You and Me" is a classic because its truths are universal, and that means they take changing forms. So how about a song called "Who Needs to Bully?" The first verse would be about the person who bullies, who believes he or she has only two choices: to be the victim or to be the victimizer. The second verse would be about the big freedom that comes to both victim and victimizer when they learn that people are linked, not ranked. Or how about a story called "It's Never Okay to Hit" -- told by a grown-up who was abused as a child and thought it was her or his shame and fault? The final words would be: "If even one generation of children were raised without violence, we have no idea what might be possible on this Space Ship Earth." Finally, we need a parable that tells the story of women and girls who are forced and pressured into having babies they don't want. It would tell the truth about why nations and religions have done the forcing, and its last line would be: "Every child has a right to be born loved and wanted." Its title would be, "My Body Is Mine." And now for a not-so-serious P.S. : Kids love songs and stories in which they are the grown-ups. How about: "How I Taught My Dad to Stop Smoking," or "How I Got My Mom to Vote for What I Need in School." obsession, leading to such extreme conditions as anorexia or bulimia. And boys are not immune to a fixation with body-image. Some become preoccupied with building bulk and muscle -- which, within reason, is a good thing -- but they can get overly invested in attaining a physical ideal that may be beyond their reach. The media often contributes to this problem by sending a message to children that projects an impossible perfection. I believe that children would benefit from a far more important message: What you are -- and what you look like -- is good and worthy of love. Letty Cottin Pogrebin (consultant; co-founder of the Ms Foundation): What should we tell children today that would make them feel even more "Free to Be?" Don't dress your spirit in a straight-jacket. Feel free to question authority. Chart your own journey, rather than follow conventional routes or someone else's well-trodden path. Follow your genuine interests, not other people's ideas of what you should be doing or caring about: choose your own music, read your book if you don't like video games, and create your own personal look instead of slavishly doing, watching, listening to, or wearing what everyone else is. Resolve today to be the most authentic, true-to-yourself person in your crowd -- and eventually you'll become its leader. 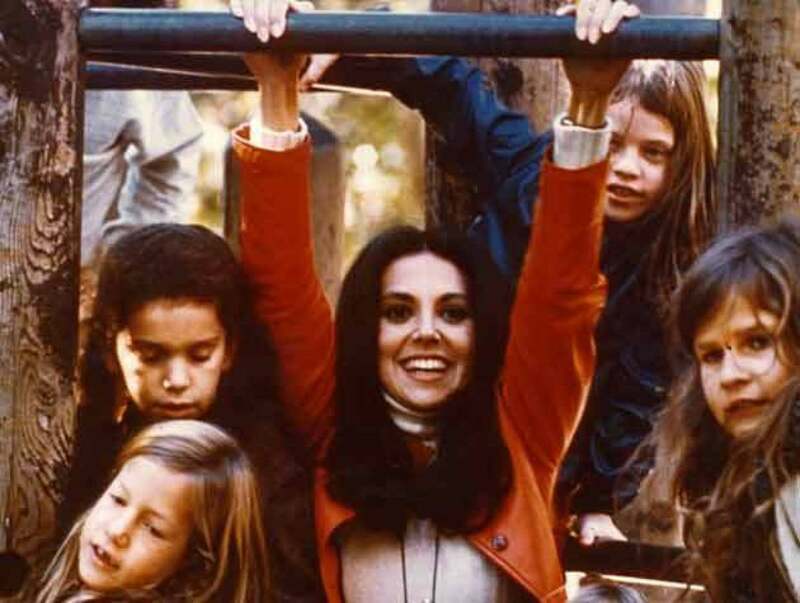 Making "Free to Be...You and Me" was such an unforgettable experience for me -- and I loved "hanging out" with the kids. This picture was used in the original version of the book.